I'm calling it sushi. You can't tell me it's not sushi, even if the rice component of our preparation is smashed flat and baked. Crackers, yeah, baby. Which makes the sushi easier to eat and a lot of fun to boot. Who doesn't like cracker snax? I am sad to say the raw tuna on my "sushi" might be wrong, wrong, wrong. There it was in the fishmonger's case, petite and fresh and ruby red, and somebody — not me — bought it. Oh, wait! It was line-caught ahi from Hawaii, and that's fine. Thank goodness for local grocery stores with greeniness. So here's the deal. 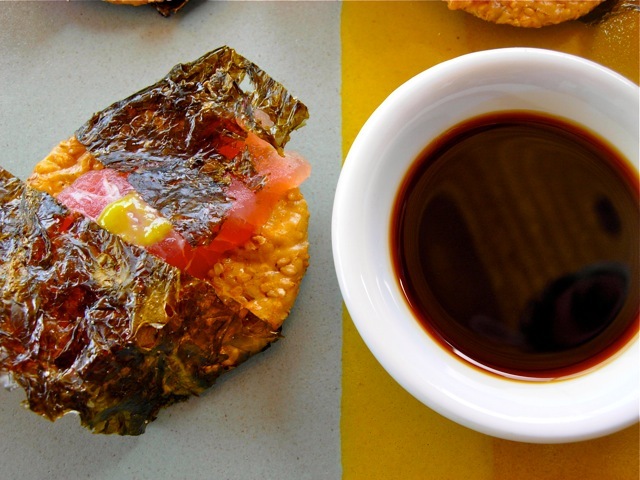 Rice crackers (these were basted in soy sauce and studded liberally with sesame seeds). Little dab of ahi, smoodged with some wasabi. (This wasabi came in a plastic tube; I think it's adulterated with starch, hence the creepy sheen. But it has romantic connotations, having been purchased in Kauai.) Wrap this contraption with a strip of nori (the Korean kind is particularly crisp and fragile). Serve with soy sauce, in case you need extra sodium. Okay, I relent. I'm not calling it sushi. I'm calling it munchi. Not to mention all the hundreds of other wells out there, just waiting to blow out. This spill was inevitable - why do we never think ahead about what to do when these accidents happen? We could have mobilized the fishermen to lay booms two weeks ago, had that contraption to plug the leak on hand and ready to place, and recruited all the tourists to clean up the beaches. If only we had planned ahead. YOu make me want to hop on a plane to Hawaii. This sounds like a close second. Your take on sushi is outrageous (in the goodest sense)! Zoomie: They are literally sending poison down to the leak. Roxie: No, you can easily do this at home. So simple! But... Hawaii is damn fine. Kudzu: It made for really fun munching. So cool and amazing! Creativity is whats for dinner. This reminds me of the way we ate poke in Hawai'i- only on fried slices of lotus root. Good for you, you rebel. And happy birthday- I'm in the city right now with only my phone so I haven't been reading regularly. Commenting makes my thumbs hurt, but you're worth it. Greg: Just let your imagination run. We are not limited to cookbooks. Peter: Fried lotus root! Are you hitting on me? Apparently they are now using animal and human HAIR to soak it up, erk. I like it. Interesting, colorful and sounds delish. Gypsy Chef: I can't overstress how easy it is to assemble, and then eating it is pure elegance! Go have fun.